Kids love these at the beach! 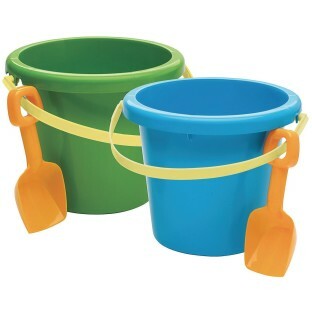 Plastic 2-gallon pails with sturdy handles and shovels. Measurements of pail are 12” x 10-3/4” x 9”. Three each of 2 assorted colors. Colors will vary. This was the perfect super durable cost effective party gift. I loved giving these out to the children at the beach party.